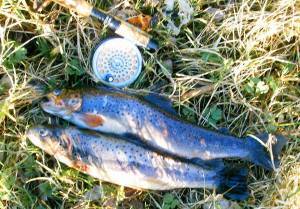 For the brown trout angler, winter and closed season are always much too long. Sometimes you don't really know how to cast a proper line, after all these months of abstinence. The flies you have tied, during long winter evenings, are all in their boxes, waiting to be tried and tested. Then the first of March comes along, like a saviour, but alas, it is mostly much too cold, much too windy, much too wet, or a most complicated mixture of everything. "Usually it picks up after St. Patrick's Day", a fellow angler told me once. 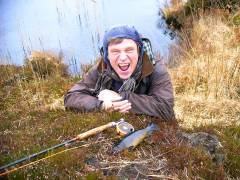 That was about twenty years ago, and global warming with greenhouse effect have obviously not changed that fundamental wisdom regarding Donegal brown trout one bit. 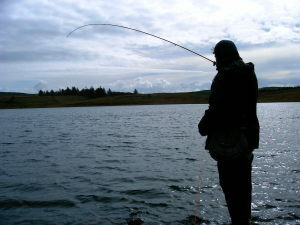 Though this year's weather and water levels permitted a few hours of fishing on the first of March, apart from a few pulls and some very small trout, there was nothing in it to make the pan smell. They were just not ready for it. In these early days of the Brown Trout season I love to fish little mountain streams. They are so fresh and lively, just like the trout in them. Very often you will be surprised at the size of fish coming out of these little waters. Brooks, often not wider than a few feet, can provide great sport for those who know. Particularly when there are pools. And the fish in these little rivers are usually the earliest trout you can catch in any season. When they are still lying deep in lakes and bigger rivers, not going for the fly at all, the mountain stream fellers are already on the go. Now, since these bubbling brooks are so very small, you will find yourself easily over gunned with the usual 9 or 10-foot class 8 trout rod. Something a bit more petit is called for. Like a class 4 or 5, 7 to 8 foot long rod with a simple, matching DT line. Long distance casting is not necessary at all. The art of casting is here often restricted to hitting the water, instead of the banks. 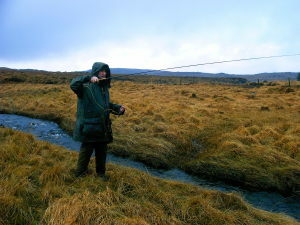 Once you have found your mountain stream, the most likely place to catch that early trout is where it shoots into a pool. The slow and deep stretches, where you would expect the best fishing, are mostly very unproductive this time of year. Depth and speed are other factors to take care of. Slow and deep is all I have to say to that. To get down there, a weighted nymph is all you want. For me a pheasant tail nymph, the thorax made up from copper wire, has served best. It sinks pretty good and the fish like it. When you prefer the two fly set up: a Butcher, tied in only two feet above the nymph, works wonders. So, when the early season blues hits, pack your bag and head for the hills. I'm sure there is a mountain stream near you, where lively trout will take the fly. 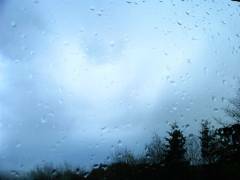 Once St. Patrick's Day (17 of March, for those who aren't too familiar with Irish peculiarities) is over and the weather picks up a bit, the keen angler can't wait to get at the lakes. "They are still laying deep", some people may say, of course that is nothing but a lame excuse for sitting by the fire, having a lazy afternoon. The passionate angler is different he has to be out fishing. 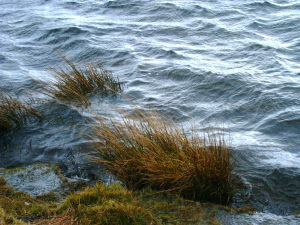 Storms of wind, rain, low temperatures, big waves on the lake, nothing can hold him back. This is not a day to be out on a boat. You are walking along the shore, trying to get the wind from behind. There is no chance casting into it. You are looking for some shelter, maybe a little cliff or a line of trees, anything to break the wind a bit. Memories of other stormy March days come up, telling you where to try particularly hard, where to persist that bit longer. At this little bay, near a boulder, by that little island or under that lone sally bush, where the little stream runs in. You have fished all these places in the past, and you have caught fish in all these places. You can remember when the surface of the lake was alive with rings of rising trout and every cast rewarded with a take. Today is different though. Mid March is not the time to expect many rises. Deep and slow is the rule of the day. You would think a weighted nymph should do the trick, but you have tried that again and again with very little success. 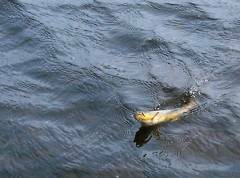 What works so perfect in the rivers doesn't do the trick in our lakes. Obviously the lake brown trout is not in the habit of taking insect larvae early in the season. Flies imitating little fish prove much more catchy than nymphs. One pattern, now over 170 years old, does exactly that and has produced time and again the first lake brown trout of the season for me. The Butcher. The standard Butcher that is, with the red tail, silver body and rib, black iridescent duck feather and black hen hackle. If you prefer the two fly set up, a Bibio as dropper works very well. Fished deep and slow, I often caught fish in March, when most anglers thought it is still much too cold, much too wet and much too windy. So, when it is March again, and you look out of the window, trying to make a decision, for fishing or for sitting by the fire - go fishing. Put a few Butchers in your fly box and head for the lake. 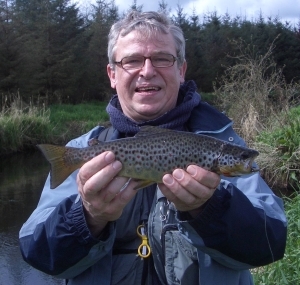 An April Trout from the Unshin River, Co. Sligo. During the trout angling season my “Two Fly-Cast Combination Game”, regarding our wet-flies, has one constant: The Bibio. It catches fish during the entire season and brown trout just love it, because it somehow represents perfectly everything and nothing. In March a combination of Bibio on the bob (where it always is) with a Butcher at the end mostly saves the day. 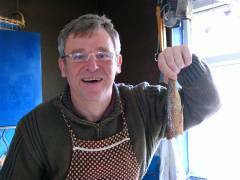 Early in the season a lot of trout take the Butcher, fished deep and slow. It is then definitely an attractor fly, since it is impossible to say what it is imitating. Most certainly not a fly. Nevertheless, early in the trout season Bibio and Butcher complement each other perfectly well and sometimes work wonders. Caught on a hefty Wickham's. When the first really mild or even warm days of April arrive at our shores, I exchange the Butcher for a Sooty Olive. The “Combination Game” is now at Bibio and Sooty Olive. The latter is not a specific pattern, but rather a generalisation of all the different Olives. This combination works particularly well in early April during the warmest hours of the day, usually between 11am and 2pm. The Sooty Olive goes back into the fly box when the first Sedges appear. That is usually in May, sometimes already in late April. It is time for the Wickham’s Fancy or the Invicta now, until the end of the season. Invicta as well as Wickham’s can be hefty, they are not imitating miniscule insects, but sedges and mayflies. So, size 8 or 10 is okay, even when fishing mountain lakes holding only relatively small fish. Flies should not be more than three feet apart. It is the same every year, always the same “Combination Game”. Like the seasons follow one another, the various fly and insect species follow one another, leading to the conclusion: you have just to do the right thing at the right time at the right place and you’ll catch fish. Following my “Combination Game” I need only 5 patterns to catch lake trout from March to October. P. S. Finally the make up of a cast: as long as possible, the two flies no further than three feet apart. The Bibio, never be without one!